This week I had the wonderful opportunity to spend time with my DH. Thanks to my dear friend Malin, who mothered my two girls and dog for us, we were finally able to spend a few precious days together, just the two of us!!! J.J. had to head to Las Vegas for work and invited me along being there was going to be "down time" between work sessions. Let me just say that 11 years is far too long of a time to wait to spend some time without children - LOL! This was definitely a treat!!! When J.J. wasn't working we went exploring. There is a LOT to explore in Vegas. We mostly just went from hotel to hotel looking at the different themed lobbies and shops. I felt sorry for J.J. being that he had to push me pretty much everywhere in a wheelchair. I still can only manage a block or two before needing to rest and it takes a LONG time to walk that short distance - I think it was a 1/4 mile just from the check-in desk to the elevators in our hotel. I've never seen anything quite like it! He certainly got his exercise and I learned to just accept and enjoy the ride (for the most part - there were some pretty bumpy rides at times though - LOL). The Venetian was incredible with indoor canals and architecural details that are so well thought out. Some day you will see their inspiration in designs I create Ü I studied the patterns and color combinations in the carpeting, tile work, fabrics and gift items. Being surrounded by such diverse creativity was so inspiring. It's funny how even when I leave work behind my mind still buzzes with all things creative - LOL! The Bellagio entrance, with the Dale Chihuly glass ceiling and the Conservatory prepped in all it's fall glory, was stunning. 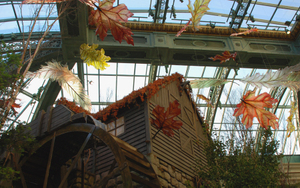 Each season the Conservatory is changed out - the old mill below was just one of the featured buildings. Large glass leaves were "tumbling" down from the ceiling throughout the Bellagio. The light shining through these leaves made them so incredibly beautiful. My pictures just couldn't capture the effect of the light. There were apples, squash, berries, mums and a myriad of other beautiful fall flowers clustered around the structures of wood, iron and glass. All were artfully arranged. 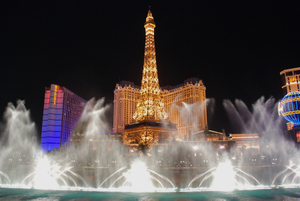 One of my favorite pictures was of the fountains at Bellagio - overlooking the Paris Hotel. This was my favorite "free" show Vegas had to offer. These fountains are absolutely spectacular, especially as they "dance" to the music during the night time hours. Now that we are back we have a LOT of catching up to do, but to take this time was so important. Thanks for sharing in my adventure and I hope to be back with some creative projects soon. I just learned that Debbie Olson was crowned the first ever Cosmo Cardmaker Picasso! You must check out her absolutely fabulous creations on the Cosmo Cricket blog. It is such a true privilege to work together with Debbie - she always inspires me and her genuine kindness is from the heart. 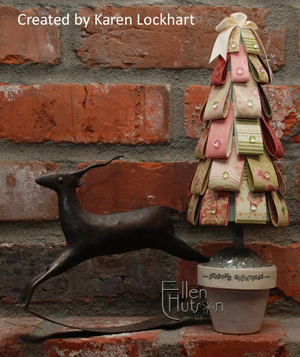 You should also head over to her blog to see the spectacular ornaments she has designed with the Lockhart angels. If you would like to purchase the Cridgeware Ornaments act fast - I don't think that Tolemine will have them for long with the flurry that these beauties have created Ü. Congratulations Debbie on the most incredibly beautiful creations yet again!!! Working together with Karen Lockhart is in one word - FUN!!! It never ceases to amaze me when she shows up with some new "item" that we can think about using in a different way. Karen is so incredibly creative and resourceful. Her work is absolutely meticulous and when we team up, well... it is so much "fun". It was a couple of weeks ago when Karen came to my home and shared her knowledge as to how to correctly cover these cornets. We went through the covering of one - she did the hard part (at least that is how I had perceived it in my mind beforehand) and I took the pictures - LOL! Well guess what - it wasn't hard at all!!! Karen has created the perfect template for both the interior and the exterior of these "cones" and she walked me (and now us, because I have put together a "tutorial" based on her direction to include in the kit) through the exact steps that she follows when covering them. Here is our very first creation, the Noel Cornet Kit. This kit comes with all the "odd pieces" that you will need to create six (6) of these beautiful cornets! It includes step by step instructions, as well as the inner and outer templates for covering the cornets. These will make BEAUTIFUL additions to any Christmas Tree, Garland, Chairback, Doorknob - I can hardly wait to hear your thoughts as to where you might locate something like this in your homes. You could also use it as a hostess gift during the holiday season or gives these as gifts to family and friends. For the picture I filled it with some lovely potpourri that I have. It even has little pears, fruit slices and berries in it and it smells OH SO GOOD! Other possibilities for fillings could be small candies or cookies, or greens and berries - again it is limited only by our own imaginations. I thank Karen for sharing her creativity with me, with us! On her website she has shared other projects that she has created using the cornets. Below is one of the projects that she has created - she includes brief directions for it here. Those are Dew Drops adding the sparkle and shine. This twill is what Karen used for the band and the crown. Can't you just see one of the Nestability Stars atop this cute little tree? Once again Nichole has hit a home run with her sets this month. They are SO easy to work with and so many ideas kept popping in to my head as to how to use them. I decided to keep it REALLY simple this month and focus on making the projects easy to replicate. This first card was made using the Snowflake Serenade set, the font used on the larger words in this set is just GORGEOUS. For this card I began with the May Arts ribbon. I adore the slight shimmer and the colors in this particular ribbon. Then I only needed my Versamark pad, Soft Sky ink pad, I Kand-ee Pearlescent Chalk, Egyptian Gold EP (this EP is SO over the top sparkley - I just couldn't resist), some Powder cardstock, and my piercing tools. My biggest tip with this type of design is to stamp the "Peace" first, sprinkle it with the embossing powder and then heat set it. Next stamp the snowflakes one at a time and shimmer them up with the Pearlescent chalks. If you stamp your snowflakes first unfortunately they still have some "sticky" to them and guess what - the EP sticks to them as well. Hmmm - guess how I know that Ü. It was an OK look, but... I really wanted it to look clean and sophisticated. I know that you could make a whole series of these cards in no time at all and that was my goal for this project - simple sophistication. Next was the Eat Cake set. One of the first techniques I learned as a beginner was "stamping off". 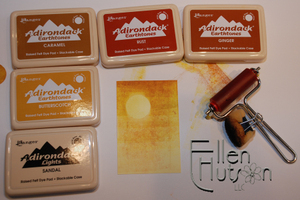 Using this technique you ink up your stamp image and then stamp, stamp again and then stamp yet again without reinking your stamp image. This was a bit of an experiment on my part being that I was curious how acrylic stamps would do with this particular method. Well... they worked just great. I believe that chalk ink will be your best bet when using this technique with acrylic stamps. To create this project I inked up the cake stamp using two different colors of chalk ink and then stamped it off three times on Shimmery White cardstock. I then inked up the flowers and stamped them on each of the three layers. Being that you can see right through the stamps it was simple to place the flowers in the same position on each of the three layers. I sighted on the lower right flowers and the top left flowers, finding my intersecting points on the cake and just stamped away. To create the layered look I cut the lightest layer out in it's entirety, shortening the edges on the underlying layers that needed to be hidden beneath. Then repeated my cutting using only two layers and lastly one. 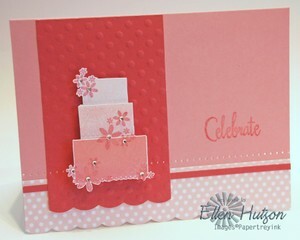 Using pop dots I positioned the cake in layers and added Micro Twinkle Stickers to the centers of the flowers. In hindsight I would have used a deeper color on the flowers to make them pop just a little more off the cake, but... time was of the essence. The polka dot paper is Nichole's very own. You can find the digital paper here. Yes, I know it is blue - but that is the joy of digital designs. By opening it up in your photo editing software you can easily change the hue and saturation of the colors and voila - it coordinates perfectly with whatever color scheme you are using. In this case I used Begonia and Peony - two of my favorite Memory Box colors. 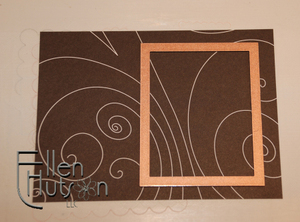 The little "swiss dots" were created using a Fiskars texture plate, tan embossing mat and Wizard. A little texture adds so much to these simple projects. The scalloped edge was once again cut using my Create-a-Cut. Oh how I wish I could share more information as to where you could find one of these, but unfortunately I have no idea what has happened with the manufacturers of this product line. I absolutely love my cutter and I have received many, many emails from you as to where you might get one and I just don't know. I hope you enjoy the simplicity of these projects - it is such fun to have the opportunity to stamp!!! I'm not certain where to begin other than the beginning, so grab your favorite drink and settle in - LOL! This adventure began less than a year ago. Many of you kept wondering where you could get Lockhart Stamp Company images, as well as some of the tools that I had fallen in love with over my last five years of crafting --- unfortunately I had no place to send you. At that point my DH and I made a leap of faith and we, Ellen Hutson LLC, went ahead and opened an on-line store to help meet your needs. Never would I have dreamed that it would grow at the rate it has. I appreciate you all SO much and we hope to always be able to be here to help you with your creative needs and provide you with top-notch customer service and quality products. If something falls through the cracks please let us know - it is of the utmost importance to us that we follow through with every aspect of this business that has developed over the past year. With that growth have come growing pains - I had less and less time to create and educate. As you have all probably figured out by now, I love the creative and educational process and therefore it was most important to me that I continue to provide that for each of you. I knew that if I didn't take care of the "business" aspects of this business I had started then nothing could continue to happen. So I went in search of other women who also believe in the value of creativity and education. That search led me to the amazingly talented women who I am so proud to call my business associates. Debbie Olson, Michelle Wooderson and Trudee Sauer are each so gifted and I feel blessed that they have agreed to work with me, as well as work with the companies that I have developed strong relationships with over this past year. These women have set goals for themselves and their "little businesses" and together we are trying to move forward to provide you with inspiration, education and a smile each day. One of the things that I have learned over the course of my short "career" is to value the talents in others and to respect their rights. With this respect comes my belief that women should not work for free. My desire is to assist in leading this industry towards making changes in how it is that designers and concept artists are compensated for their hard work. One of the projects that we are working on are Class Kits. These women are fantastic educators and we know that you can't fly all over the United States to attend their classes, so we are trying to bring their instruction to you by putting everything together in a box and sending their class directions to you. Along with those instructions will come all the "unusual" ingredients to create that project. When fitting, you will also be able to purchase additional items to create more of that same project. Proceeds from each sale will go directly to our business associate who has created that kit! I am SO thrilled to share the first of these kits with you tonight - Rose Bracelet!!! 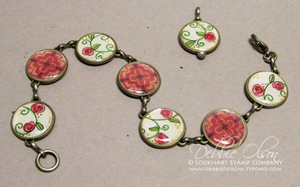 This incredibly beautiful bracelet and charm have been designed by Debbie Olson. Please visit our webstore to learn more about what is included in this Class Kit. There will be more kits to follow soon and they are BEAUTIFUL! I thank you in advance for helping us realize these dreams. Please join me in congratulating Debbie on her first kit!!! Growing up on a farm in Alberta we experienced some of the most incredible sunsets. We never did have a scarecrow quite as "good-looking" as the one in the Lockhart Stamp Company collection, but this image just struck a chord within me when I saw a card that jumped off the screen. It is not often that I have time to puruse the wonderful gallery over at Splitcoaststampers, but I am so thrilled to have found this beautiful card created by Zindorf. You really must go and take a peak at her entire gallery - I love the bold colors and striking presentations she has used in her pieces of art. The open prairies afforded some of the most remarkable scenes, including the geese flying past the evening sun - these sights will permanently be ingrained in my memory. I hope you enjoy my version of Zindorf's spectacular sunset. I created a circular eclipse mask and placed it on Sweet Corn cardstock (I just love the names of the Memory Box papers, but they make me hungry - LOL!) At this point I needed to make a decision. I toyed with using my airbrush being that it would be SO quick and easy, but decided to go with the traditional brayer method being that I REALLY wanted that "rolled", layered look that only a brayer provides. As you can see I utilized my teeny, tiny brayer along with numerous Adirondack colors and a sponge to create this scene. Locate your mask where you want your sun to be and brayer on your colors starting with the lightest at the bottom and working to the darkest at the top. Remove your mask and sponge the sun tapering out your colors towards the bottom, right edge as shown. 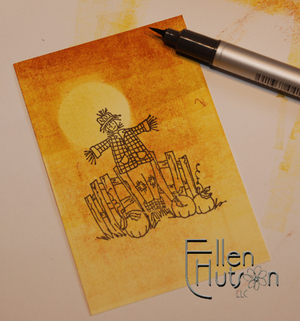 Stamp the scarecrow image in black and then color in the image with a black marker. I have found that the Copic Multiliner Brush Pens are awesome little tools. They allow you to letter in a calligraphy type style, as well as color in small scale images like the one above. The tip allowed for awesome control - I was thrilled with how easy it was to color in such a detailed image. I then used a white gel pen to add the highlights to the image. I then created a frame out of Spooky cardstock. Following is a quick tip on how it is that I position my Nestability die to ensure proper placement when I cut windows. Being that I have access to loads of magnetic placement mats I decided to try something different with one. When using the Wizard to cut, one must always use the white spacer plate, so I cut a magnetic placement mat the same size as the white spacer plate and adhered the two together. This gives me a nice sturdy magnetic mat that I can then position over my sandwich with ease. Last but not least I added a simple embellishment - Flame Dew Drops. If you haven't discovered these little gems yet don't delay. They are flying out the doors - I do believe I may have another preorder in my store soon - LOL! These are so easy to apply - for this card I used mini glue dots, but you could also use a myriad of other adhesives to adhere these lightweight little treasures in place. I would like to challenge you to create a "Zindorf" sunset and please post a comment to her gallery if you are inspired as well. Don't forget to enjoy the fall beauty that is so short lived! It seems that at times life takes one step forwards and then two backwards. It was certainly one of those "backwards" weeks for me. Unfortunately it was a little more than two steps yet again. I feel badly for my DH being that now he is once again the chief cook and bottle washer at our house. It was just one of those "Oh no!!!" moments when my foot took an impact squarely on that broken bone. Fortunately it is only a 2-4 week set-back, but I am once again supposed to rest the bone for at least two weeks, icing, yada, yada. This happened on Tuesday and I'm finally able to laugh about it just a little and also wonder how on earth these things happen - LOL! 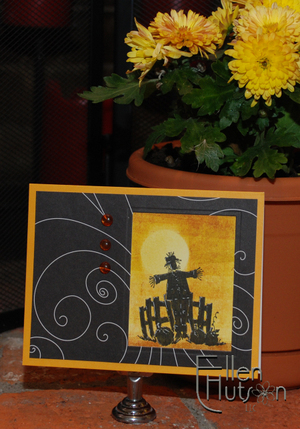 Yesterday was World Cardmaking Day and I know that festivities abounded everywhere. I sincerely hope that you all had a blast and I apologize for not being here to party with you all! I am doing my best to follow doctor's orders and remain off my feet as much as possible. I want to avoid surgery at all costs. I can promise you this though - when my life finally get's turned around I will definitely throw a huge celebration party here!!! Fall is in the air here in Seattle. In fact it has been pouring on a daily basis. The month of September had 4X it's normal rainfall - uggh! Every year during the fall/Thanksgiving season it becomes important to have hostess gifts ready to go at a moments notice. This little votive holder creates a soothing, warm ambience to any setting - be it a powder bath, a countertop or a coffeetable. It will help melt away those rainy blues. To create it is simple. I found these votives at Michael's and purchased a bunch of them perhaps a year or so ago, so I'm not certain if they will still have the same type in stock. 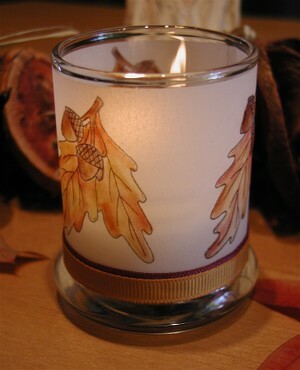 Stamp the Two Acorns on a stripe of parchment paper or vellum using Palette Noir Ink. Color in the image on the opposite side using Copic markers. Unfortunately I do not have a step by step of the coloring process on this project being it was created several months ago. I also did not write down which colors I used - sorry about that, but you can see a step by step tutorial put together by Karen Lockhart using Prismacolor color pencils. 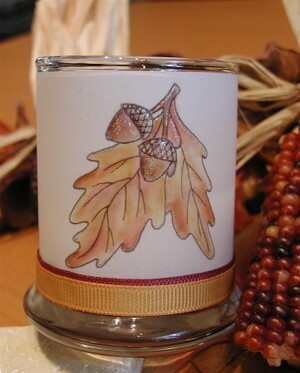 To add definition to the acorns I used the Sakura Clear Glaze Pen. Using sticky strip up the back side I adhered the vellum to the votive and then added the burgundy and mustard grosgrain to the base to finish it off. I thought I'd leave you with a picture of it all lit up. It is so soft and pretty, with the scent of vanilla now wafting through the air on this cold, rainy night. A wonderful opportunity awaits YOU! This is an opportunity that is incredible! I highly encourage you to try out for this position if you are interested in furthering your career! Jeff and Stacey are wonderful to work with and you will be given opportunities you've never had before. Go for it girls!!!! Send in your best work NOW. I can NOT believe it is October already. Where has this year gone?!? I feel like I'm treading water and just barely keeping my head up - LOL! I am thrilled to report that I am beginning to walk a lot better. I have been working with Carrie, who has been such a wonderful help in bringing the pain levels down to a more tolerable level. It is still difficult to get around, but is getting easier each and every week!!! OK - so this month I just had to change it up. 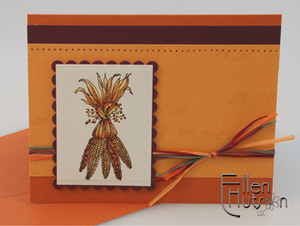 I adore the fall images that Karen has in her collection and I just could not go through the season without putting one in a Stamp of the Month Packet. 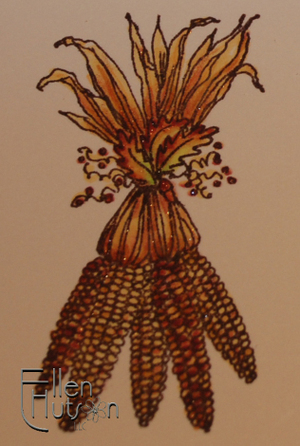 So I began creating a card using this month's stamp of the month - Indian Corn. 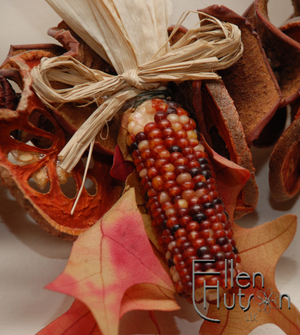 I LOVE the colors in Indian Corn and used some that I have hanging as a garland over my pantry door, as the inspiration for my coloring. Last month's image was colored using Prismacolor Color Pencils - typically this is the medium I have been using for the Stamp of the Month project being that I believe most of you own Prismacolors. Now that many of you have purchased the Copic markers from me I have decided to switch it out and share with you which Copic colors I would use to color in the image. I then used this image on my Thank You notes this month as well as the stamp of the month packet example. Yes that's right - each month I color the Stamp of the Month to use for the Thank You notes so that if you do choose to purchase this stamp or packet you will have a close-up view of the image I have colored. When coloring using Copic markers I typically lay down my lightest colors first. This image is so incredibly easy to color being that the base color is pretty much all over. Using Y21 and YG00 (on the leaves only) I quickly colored the entire image. Being that I didn't want for the darkest colors to just explode off my project I colored them on to a plastic surface and then using my Y21 picked them up and added them to my project as shown below. I did touch the tip of the R59 to the berries and only a few of the kernels of corn. The YR21 was also used directly on the husks and corn kernels. All other colors were added using the Y21 as my base marker. Once I had all the colors in place I used the orange Spica glitter pen to add that shimmer you see. Using an extremely light hand I just lightly twirl the glitter down the left hand side of each cob of corn as well as up some husks and the center of the leaves, finally dotting the berries with the glitter as well. I find that less is more in this case - I always try to achieve a balance from left to right and top to bottom when applying glitter to images. Next I determined how it is that I would complete this project. As luck would have it I had a fabulous spool of Raffia in stock - it has a total of five colors in it and I couldn't believe how well it went with the image. Pure luck I tell ya! I pulled some Memory Box cardstock (Cantaloupe and Burgundy) and notecards (Jack O Lantern) and was thrilled with the beautiful color scheme that nature had provided. Being that I wanted to keep the elements basic rather than adding a patterned paper to the mix I added yet another stamp - Give Thanks. I loved how this sentiment has the little acorn and leaves swirling off the ends and felt that it made a wonderfully subtle element to the background design. Other ideas that would be fun to make with this stamp are place cards for your Thanksgiving table (I hope to share that idea with you soon), thank you note cards, or even focal points on napkin rings! Wish me luck on my to do list so that I can get back here in a timely manner to share these creations with you sooner, rather than later. ETA Again :D - you must check out Debbie's latest tutorial on using the magnetic placement mat to cut and emboss a frame. I must tell you that I LOVE this new accessory! It has helped me keep my dies positioned so much better than in the past!